After a hard day on the slopes, why not indulge yourself with a luxury massage from our Pamper Partners. Given their high quality customer service and some fantastic feedback from our guests, we're partnering with Ski Physio, Mountain Rehab, MassageMe and Alpine Sports Physio to offer massage services. Ski Physio massage services are available in Val d'Isere, Meribel, Courchevel and La Plagne. For guests in Morzine, Avoriaz and Les Gets, Mountain Rehab offer a mobile service across these resorts. MassageMe will be bringing their mobile services right to the chalet door in Alpe D'Huez. Finally in St Anton and Lech, we've partnered with Alpine Sports Physio. Once the sole preserve of super-luxury ski lodges, hot tubs have now become the ubiquitous après-ski indulgence and are a fixture in most of our chalets. There can be few greater pleasures than basking in a bubbling tub and nursing weary limbs after a cold exhausting day on the slopes. Or why not have the ultimate extravagance of a day away from the piste and a morning laze in the hot tub after a relaxing massage. The snow capped alpine backdrop makes a refreshing change from your local gym. After a long days skiing in 'the greatest ski resort in the world', relax in one of our hot tubs which boasts a stunning mountain backdrop. All four Bellevarde Lodges have an outdoor hot tub and two of them also have access to the swimming pool and spa facilities opposite our CLUB Bellevarde. At our Aspen Lodge three of our suites have a private outdoor hot tub and guests have access to three communal hot tubs on the terrace. All our Alpe d'Huez chalets have a luxury hot tub and sauna for the ultimate relaxation. After a hard day on the slopes you can ski to the door and be in the pre-heated hot tub in no time. In Meribel you're spoilt for choice with an outdoor hot tub in all of our chalets. Bellacima Lodge has a small counter current pool and you'll find a sauna area in Taiga Lodge, Indiana Lodge, and Chalet Mariefleur. Two of our Courchevel chalets have a luxurious steam area. In Founets Aval you can enjoy a sauna that turns itself into a steam room or relax and enjoy the large steam room in Founets Amont. 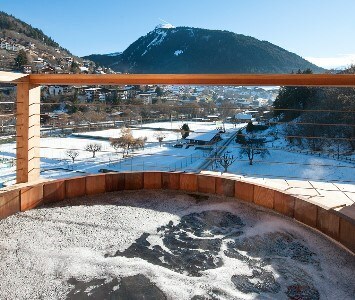 In 5 out of our 7 Morzine chalets you can enjoy the luxury of relieving your aching muscles in a hot tub and sauna. There's outdoor hot tubs in Chalet Kaila, Colibri Uno & Colibri Penthouse and The Manoir. As well as a communal outdoor hot tub for all guests, our Altitude Lodge also has three rooms with private hot tubs on the terrace. Guests can bubble away in a hot tub without even needing to leave the room. The location of Chalet Poudreuse is unrivalled which means as soon as you click your ski's out of there bindings you can relax in style. 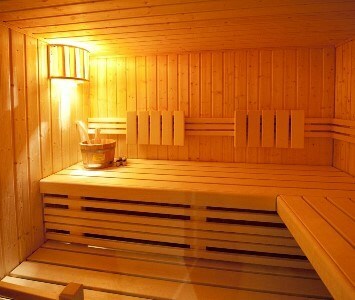 The chalet offers a sauna to ease the muscles after a day on the slopes. Sit back and let us do the work whilst you are enjoying our relaxation suites. Grab a glass of champagne and cheers a great day and an even better holiday. In our Hotel Theodul there's a large relaxiation area with saunas, hammam, a massage area and an outdoor pool - new for this winter.